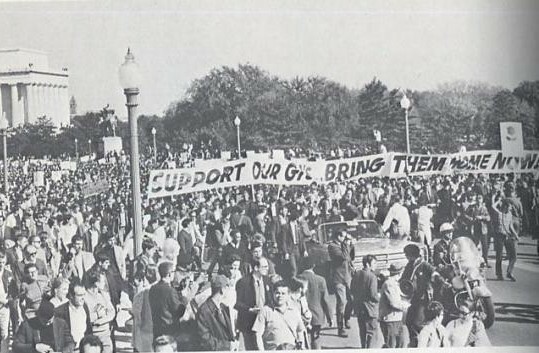 Demonstrators at the October 21, 1967 march on the Pentagon carry a banner that says, "Support our GIs, Bring Them Home Now." Most of the allegations about insults directed at soldiers or vets from war opponents have been fabrications to discredit the antiwar forces. The Pentagon has just launched a multi-year national public relations campaign to justify, glorify, and honor Washington's catastrophic, aggressive, and losing war against Vietnam -- America's most controversial and unpopular military conflict. The first is to legitimize and intensify a renewed warrior spirit within America as the Pentagon emerges from two counterproductive, ruinously expensive, and stalemated unjust wars in Iraq and Afghanistan, and prepares for further military adventures in Asia, the Middle East, and Africa. Within days of Obama's speech, for instance, Defense Secretary Leon E. Panetta announced a big increase of U.S. Navy forces in the Pacific, a move obviously targeting China. At the same time the Obama Administration's drone wars are accelerating as the Oval Office's kill list expands, and the president engages in cyber sabotage against Iran. The second is to dilute the memory of historic public opposition to the Vietnam war by putting forward the Pentagon's censored account of the conflict in public meetings, parades, and educational sessions set to take place across the nation through 2025. These flag-waving, hyper-patriotic occasions will feature veterans, active duty military members, government officials, local politicians, teachers, and business leaders who will combine forces to praise those who fought in Vietnam and those on the home front who supported the war. There won't be much -- if any -- attention focused on the majority of Americans who opposed this imperialist adventure, except as a footnote describing how tolerant U.S. democracy is toward dissent. President Obama lays a commemorative wreath during Memorial Day ceremony at the Tomb of the Unknowns at Arlington National Cemetery, May 28, 2012 in Arlington, Virginia. Photo by Mark Wilson / Getty Images. May God bless you. May God bless your families. May God bless our men and women in uniform. And may God bless these United States of America. 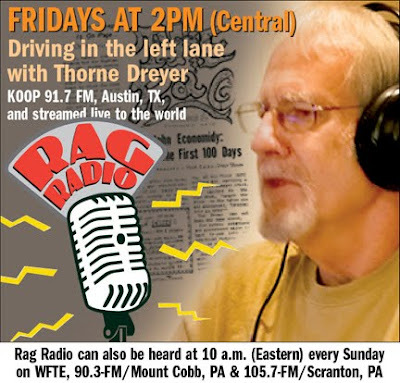 There was virtually no criticism in the corporate mass media about the president's gross exaggerations concerning the "mistreatment" of Vietnam era veterans. True, there were no victory parades, but that was because the U.S. Armed Forces were defeated by a much smaller and enormously outgunned adversary -- the guerrilla forces of the South Vietnamese National Liberation Front (NLF) and regular forces from North Vietnam. 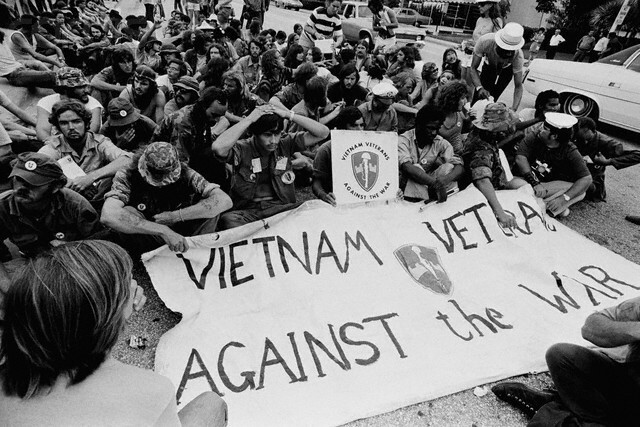 Members of the Vietnam Veterans Against the War (VVAW) hold a peaceful demonstration outside the 1972 Democratic National Convention in Miami. Photo by JP Laffont / Sygma / Corbis. 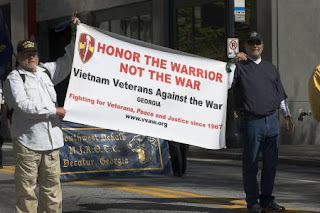 By the time many vets returned home the American people had turned against the war and wanted it over, as did a significant portion of active duty troops, including the many who identified with the peace movement or who mutinied or deserted. 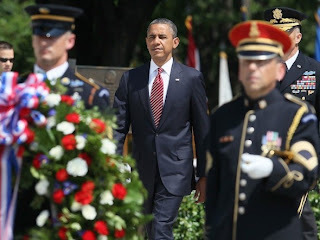 Undoubtedly some veterans were disrespected -- but to a far lesser extent than Obama and pro-war forces have suggested over the years. Whenever the U.S. conducts unpopular invasions, as in Vietnam, Afghanistan, and Iraq, Washington and the mass media invariably insist that it is the duty of patriotic citizens to "support the troops" even if they oppose the war. But to manifest the kind of support the government seeks inevitably implies support for the war. This is why the peace groups came up with the slogan "Support the Troops -- Bring 'em home NOW!" To thank and honor veterans of the Vietnam War... for their service and sacrifice on behalf of the United States and to thank and honor the families of these veterans. To highlight the service of the Armed Forces during the Vietnam War and the contributions of Federal agencies and governmental and non-governmental organizations that served with, or in support of, the Armed Forces. To pay tribute to the contributions made on the home front by the people of the United States during the Vietnam War..."
to assist federal, state and local authorities to assist a grateful nation in thanking and honoring our Vietnam Veterans and their families. Commemorative Partners are encouraged to participate... by planning and conducting events and activities that will recognize the Vietnam Veterans and their families’ service, valor, and sacrifice. When Paris withdrew remaining French troops in April 1956, according to John Prados in Vietnam: The History of an Unwinnable War, 1945-1975 (2009), "their departure made America South Vietnam's big brother," i.e., overlord and military protector against popular liberation forces in the southern half of the country. By 1968, when the number of U.S. troops attained their apogee of 535,040, Washington was obviously losing to its tenacious opponent. This is when Democratic President Lyndon B. Johnson decided not to seek reelection rather than face the humiliation of defeat. Republican President Richard M. Nixon succeeded to the presidency and vastly increased the bombings while also calling for negotiations to end the war. Facing an impending defeat and political catastrophe, American troops pulled out in 1973. The CIA and some U.S. military personnel and political advisers remained in diminished South Vietnam assisting the right wing government in Saigon until April 1975 when the entire country was liberated. The Pentagon also dumped 18,000,000 gallons of herbicides to defoliate several million acres of farmland and forests. Millions of Vietnamese suffered illness, birth defects, and deaths from these poisonous chemicals. The AP recently reported from Hanoi, Vietnam's capital, that "More than 100,000 Vietnamese have been killed or injured by land mines or other abandoned explosives since the Vietnam War ended nearly 40 years ago, and clearing all of the country will take decades more." It should also be mentioned -- since it will be suppressed during the commemoration -- that U.S. forces, including the CIA and the Pentagon-controlled South Vietnamese military, tortured many thousands of "suspected" supporters of the liberation struggle, frequently with portable electrical current. An estimated 40,000 "Vietcong" (suspected members or supporters of the NLF) were murdered during the long-running "Operation Phoenix" assassination campaign conducted by the CIA, Special Forces, and killer units of the Saigon forces. Iconic photo of crying Vietnamese children after an aerial napalm attack near near Trang Bang, Vietnam, June 8, 1972, Photo by Nick Ut / AP. Most of the allegations about insults directed at soldiers or vets from war opponents have been fabrications to discredit the antiwar forces -- falsehoods Obama chose to repeat as part of the Pentagon's campaign to reverse history's negative verdict on the war in Vietnam. The peace movement's targets were the warmakers in Washington and their allies abroad, not members of a largely conscript army. Perhaps the most notorious of the false accusations were frequent reports about antiwar individuals "spitting" at GIs and vets. The rumors were so wild that sociologist Jerry Lembcke wrote a book exposing the lies -- The Spitting Image: Myth, Memory, and the Legacy of Vietnam, New York University Press, 1998. The capacity for independent judgment among ordinary Americans is probably best shown by the swift development of antiwar feeling among American GIs -- volunteers and draftees who came mostly from lower-income groups. There had been, earlier in American history, instances of soldiers' disaffection from the war: isolated mutinies in the Revolutionary War, refusal of reenlistment in the midst of hostilities in the Mexican war, desertion and conscientious objection in World War I and World War II. But Vietnam produced opposition by soldiers and veterans on a scale, and with a fervor, never seen before. During the Vietnam War, the military ranks carried out mass resistance on bases and ships in Southeast Asia, the Pacific, U.S., and Europe. Military resistance was instrumental in ending the war by making the ranks politically unreliable. This history is well documented in Soldiers in Revolt by David Cortright and the recent film Sir! No Sir! The morale, discipline and battle worthiness of the U.S. Armed Forces are, with a few salient exceptions, lower and worse than at anytime in this century and possibly in the history of the United States. By every conceivable indicator, our army that now remains in Vietnam is in a state approaching collapse, with individual units avoiding or having refused combat, murdering their officers and non-commissioned officers, drug-ridden, and dispirited where not near mutinous. Elsewhere than Vietnam, the situation is nearly as serious. According to the 2003 book by Christian Appy, Patriots: The Vietnam War Remembered from All Sides, Gen. Creighton Abrams -- the U.S. military commander in Vietnam -- made this comment in 1971 after an investigation: "Is this a god-damned army or a mental hospital? Officers are afraid to lead their men into battle, and the men won’t follow. Jesus Christ! What happened?" One major conclusion was that a conscript army may become unreliable if the war is considered unjust in nature and unpopular at home. This is why conscription was ended for good and the Pentagon now relies on better paid professional standing military supplemented by a large number of contractors and mercenaries, who perform many duties that were once handled by regular soldiers. Vietnam Veterans Against the War at 2009 Atlanta Veterans Dav Parade. Photo by David Howell. Hanoi has several times extended the welcome mat to former antagonists, urging Americans and residents of southern Vietnam who now live abroad to "close the past and look to the future." Wherever touring U.S. citizens -- including former GIs -- travel in Vietnam, they are met with the same respect as visitors from other countries. In the U.S., the Vietnam war still evokes fighting words in some quarters. Some Americans still argue that the U.S. "could have won if it didn’t have one hand tied behind its back" (i.e., used nuclear weapons), and some continue to hate the antiwar protesters of yesteryear, just as they do demonstrators against today’s wars. 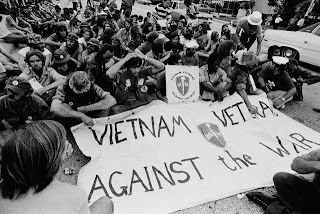 And some others -- in Congress, the White House and the Pentagon -- still seem to continue fighting the war by organizing a massive propaganda effort to distort the history of Washington's aggression and unspeakable brutality in Vietnam.